In our last post, we discussed about setting up Delivery Weekdays with Order Delivery Date Pro for WooCommerce plugin. But, for some businesses where you sell occasional things like Christmas trees which require delivery only certain days of the year as per the season. In such businesses, you might want to enable only certain days of the year in the Delivery Calendar. This can be achieved from the plugin using the Specific Delivery Dates setting under Order Delivery Date -> General Settings -> Specific Delivery Dates link. For allowing only specific dates for delivery you need to enable the setting “Enable Specific Delivery Dates” checkbox. Also, all the Delivery Weekdays should be disabled under Order Delivery Date -> General Settings -> Date Settings link. 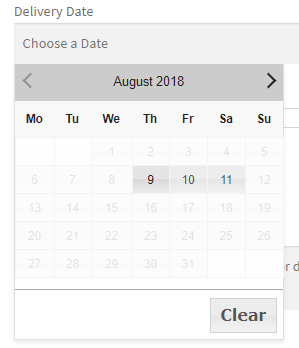 Because if any of the weekdays are selected then that weekday will be enabled in the calendar on the checkout page. Now, select the desired specific delivery dates in the Specific Delivery Date section and click on save settings. You can add only three delivery dates at a time. For adding more dates, you need to select the dates again and click on save the settings. 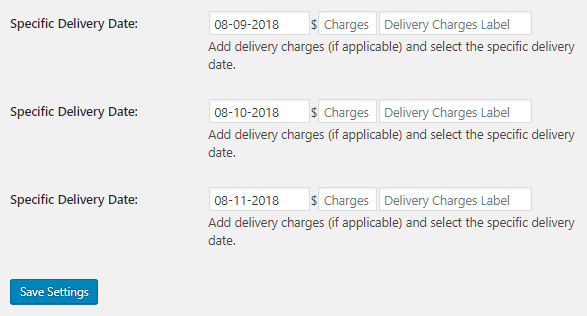 After doing the above settings, you can see only specific delivery dates enabled in the delivery calendar on the checkout page. Your Customers can choose their preferred delivery date from those dates. So if you have a business where you deliver only on certain random dates instead of the weekdays then the above setup is useful for you.